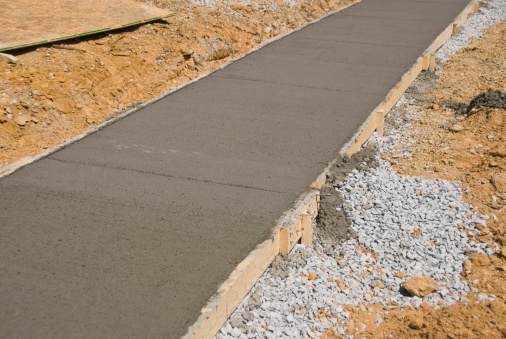 When you are working on a concrete project such as pouring a foundation or building a planter, there will be instances when you accidentally spill concrete on surfaces you don't want it to be on. 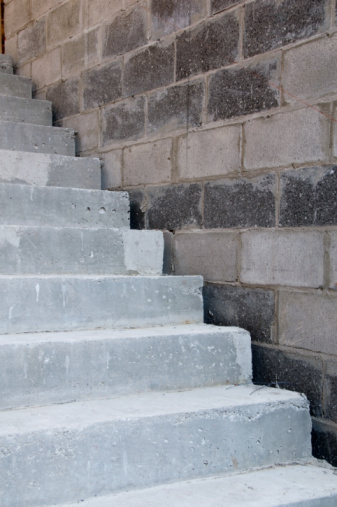 Depending on the condition of the concrete, clean up differs slightly. Wet "mud" is more easily cleaned up than dried "mud." The good news is concrete does not set and harden until about 24 hours after it is mixed. Act quickly. If the concrete is still moist and has just spilled onto the floor, douse it with water liberally to dilute it. Fill a bucket full of water and pour it directly onto the spill. Scrape up the concrete with a plastic putty knife as you continue to dilute it with water. Scrape vigorously to take up the moistened cement, throwing the spilled pieces into another bucket. Use a stiff-bristled brush to take up any remaining wet concrete. Douse with water as necessary to get up all the wet concrete particles. Continue to brush, adding water until the spill is gone. Begin to break up the dried concrete with a hammer and chisel. Start from the top of the spill and work toward the bottom. Do not start at the bottom or you may chip or scratch the floor underneath. Re-pour vinegar as the dried concrete begins to break up, and continue to chip away at the dried spill. As you work to break up the spill, the vinegar will somewhat soften the concrete, making it easier to clean up.